Ever visited a website listing businesses in your area or restaurants in town? You’ve accessed a directory. But did you ever think about building such a web page for yourself? It’s easier than it may look at first sight. WordPress provides all the tools you need to put together a pretty page. Plus, you can then promote and monetize by charging people for premium listings. For your site to attract visitors, you need an eye-grabbing design and flawless functionality. We’re here to give you a head start. Check out the best WordPress directory themes currently on the market. Point Finder’s aim is pretty straightforward. The developers want to help you create any type of listing website you fancy. All without breaking a sweat. No list featuring the best WordPress directory themes would be complete without this one. You can build your own personalized system within minutes. That’s thanks to the theme’s customizable fields and sturdy search system. 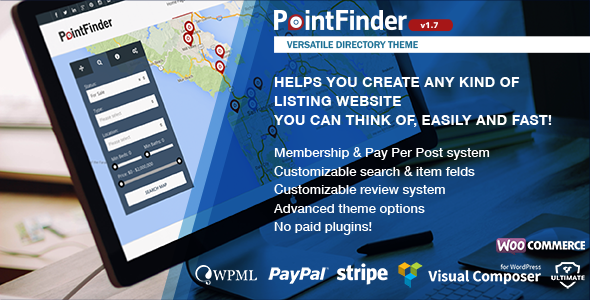 Point Finder’s impressive list of features includes Google Maps integration and many payment gateways. You also get an advanced frontend upload system. 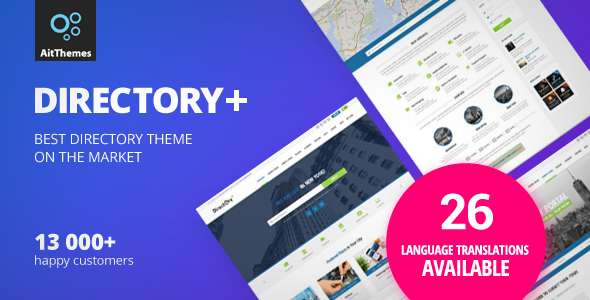 The Visual Composer plugin is bundled with the theme. Spotter is a powerful directory theme. It comes with Google Maps support. Thanks to its modern and clean design, the template is suitable for any kind of business listing. That means you can put together directories for real estate, car dealerships, restaurants, and so on. 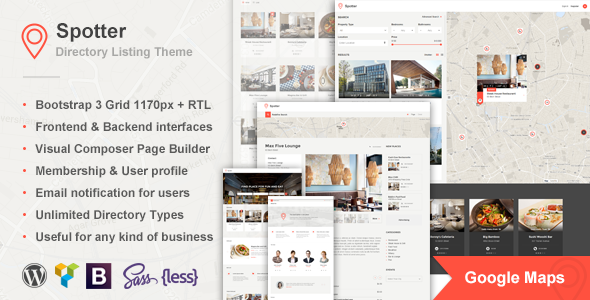 Theme features include unlimited directory types and frontend management. Membership plans and direct bank transfers are also on the list. Spotter is easy to install and manage, translation ready, and SEO friendly. It comes bundled with the Visual Composer plugin. 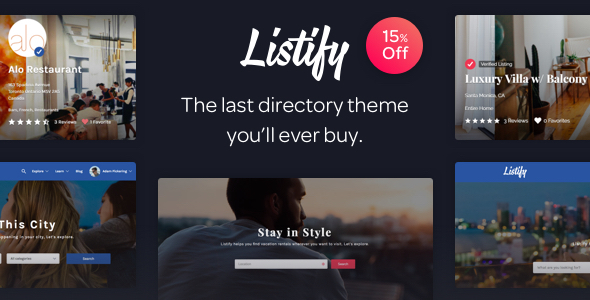 Listify offers a complete solution for users looking to build a solid directory website. It comes packed with several premium features that make your admin job a lot easier. The list includes a drag and drop editor, powerful plugin integration, and great SEO. Moreover, the theme makes awesome use of geolocation technology. It also offers several ways to monetize your site. We strongly advise you give them a try. Your site will be a thing of beauty. 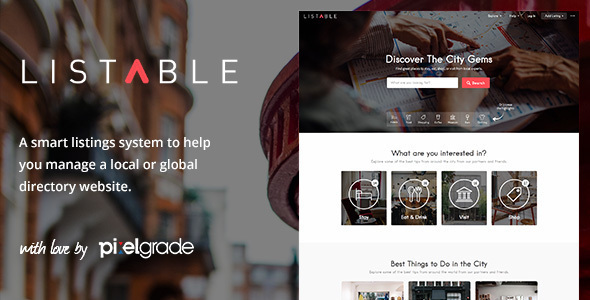 Listable was designed to adapt to your specific needs. It’s a friendly theme for anyone looking for an out-of-box directory website. That’s mainly because it won’t overwhelm you with features you don’t need. However, it will provide assistance every step of the way. Listable comes with a gorgeous interface and an advanced filtering system. Easy layout control is also in the mix. In other words, Listable is one of the best WordPress directory themes currently available. Directory Portal is one of the best WordPress directory themes on the market. First off, it offers a fresh and modern design. It also comes with a plethora of features you should get excited about. Think a drag and drop page builder. Front-end registration for guests. Geolocation support. Oh, and did we mention the theme’s powerful plugin integration? You will have all the tools you need to easily set up an online directory. Just get the ball rolling. Directory Portal will take care of the rest. 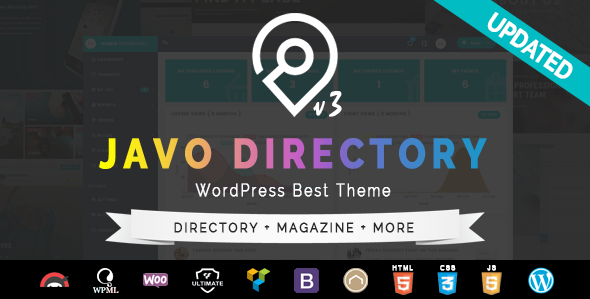 Fast and stunning, Javo is an award-winning directory theme. It was built to offer you plenty of options when it comes to both design and functionality. Javo comes with PayPal integration and advanced Google Maps integration. Mailchimp compatibility is also on the list of features. 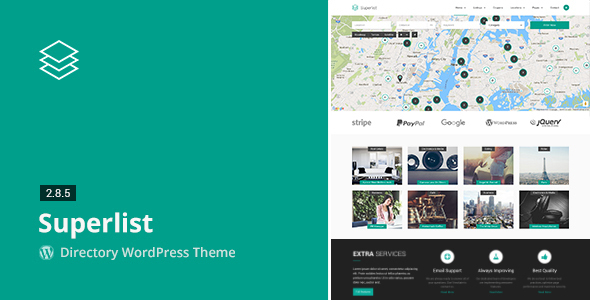 Moreover, the theme bundles two free plugins. We’re talking about Revolution Slider and Visual Composer. Javo provides easy and flexible setup options. You can have your site online in a matter of minutes. All in all, it offers great value for your hard-earned cash. 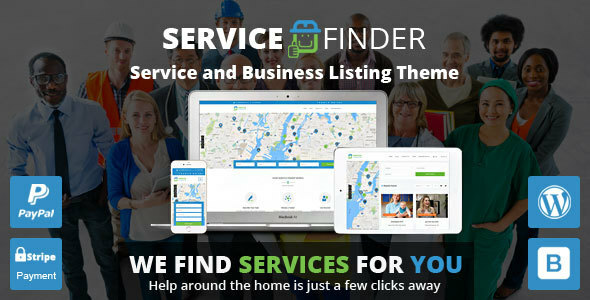 Service Finder is an advanced business and service directory theme. What’s great is that it comes with a suite of cool features. We’re talking about profile management. Timeslots management for booking. Unavailability settings. Not enough? How about staff management and booking management? Or invoice generation and payment system? Moreover, the theme is PayPal/Stripe integrated. It also offers a powerful booking function and is insanely easy to customize. Looking for a budget-friendly WordPress directory theme? Superlist is a great pick. It comes with frontend submissions and predefined listing post types. PayPal/Stripe support and Google Maps integration are among the top features. Superlist easy to use and a breeze to customize. Plus, it has a strong focus on code quality, as well as an intuitive listing type manager. Modern and sharp design? Check. Awesome functionality? Double check. 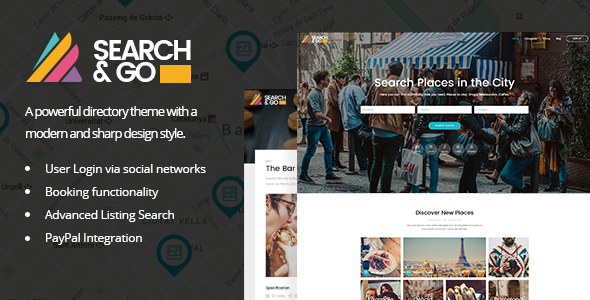 Search & Go is a powerful directory theme which offers PayPal integration. You also get booking features and social media login. It’s integrated with Google Maps. Furthermore, it’s easy to customize and comes with advanced search options. Your users will be able to find what they’re looking for quickly and painlessly. Bonus: you get the Visual Composer plugin for free! Why Choose One of the Best WordPress Directory Themes Above? A quality directory theme will come packed with all the essential features you need to get your website up and running in a jiffy. Google Maps integration is a must. After all, you need to display locations in an elegant manner. Frontend submissions are also useful. Especially when you rely on user-generated content. Dedicated sections for ads are a welcome bonus. As for responsive design and advanced customization options, these ones you can’t live without. The best WordPress directory themes offer every tool you need and more. Building a successful website will be a breeze. All without breaking the bank. Or, you know, hiring a team of dedicated designers and developers. Pick any of the themes above. You will be off to a great start. There are plenty of websites you can build by using any of the best WordPress directory themes on our list. A website that lists events in your area. One that counts tourist attractions in town. Another that tackles the best restaurants foodies should go to. A directory of local businesses worth checking out. The list goes on and on. A solid directory can help you attract visitors and generate additional income. All you need is a viable idea. Eager for more WordPress tips and tricks? Browse our website or subscribe to our newsletter.